Texwood's Redwood tables started their life in the heart of Central Otago. Planted by the pioneers in the 1800's these tables are over 100 years in the making. Redwood dining starts at $1600 for a 1.6m (6 seater) rustic scandinavian finish, or $2,100 for flawless liquid glass finish, Buy Now. A real Texwood classic with pure oil finish and bespoke hairpin legs. A table made to be used, that will last and tell stories in time. A more contemporary look from Texwood, a flawless and durable high gloss liquid glass finish. A real eye catcher! The difference in color is natural, the lighter sap wood on the outside can be trimmed away if prefered. Many different seating arrangements are available, ask us for help choosing. There are 94 countable rings on this particular table. Redwood resembles cypress. It resists fire and moisture. It does not rot. It is a soft wood of close grain and straight figure of great uniformity. It is a wood which shows very few knots and some panels six feet and more, wide are common because the trees are so large in diameter. Properly seasoned redwood does not shrink, swell or warp. It is a strong wood and a medium light one. In color redwood ranges from the lightest cherry to darkest mahogany. The grain figures are varied, too, from straight and plain to the curly figure of the stumpwood and roots. Redwood contains a natural preservative substance which prevents decay and which gives it natural seasoning qualities. 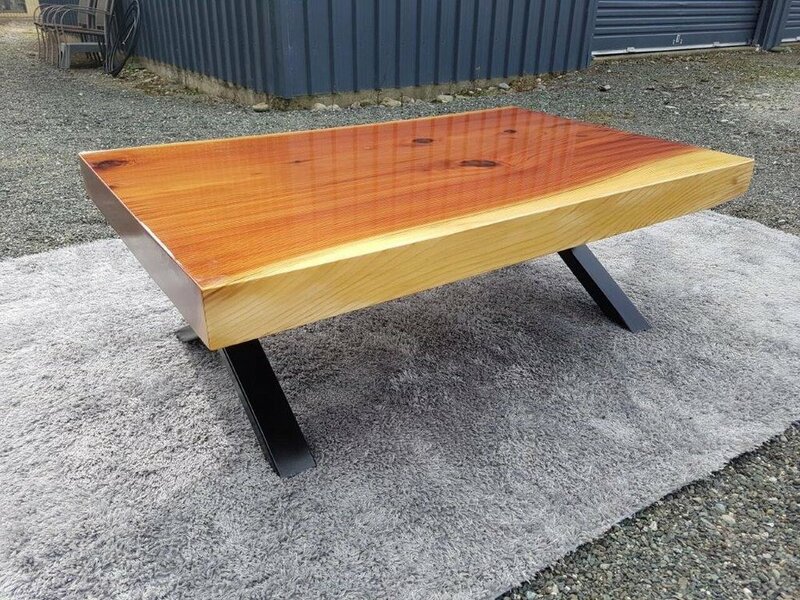 Redwood coffee tables start at $600 for rustic scandinavian finish, or $1,000 for flawless liquid glass finish, Buy Now.